It’s that time of the year to have fun with glass and get into the Holiday spirit! 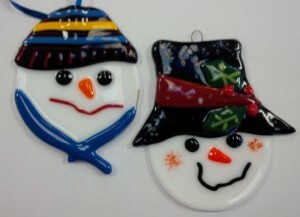 Each workshop costs $65.00 plus hst per person to make 3 Fused Glass Ornaments. 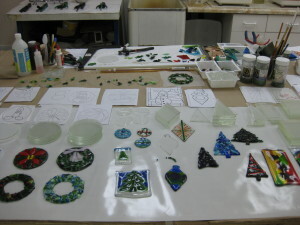 This fee includes the glass, supplies and firings to make your ornaments. I have many samples to give you ideas. If you have glass cutting tools and safety glasses please bring them. If you don’t have tools – no problem- we have some for you to use. No glass experience necessary. I will show you how to cut glass or you can decorate with our glass pieces, stringers and noodles. 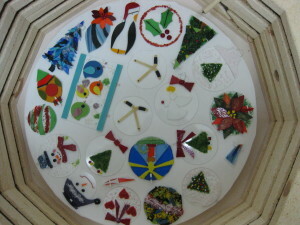 Ornaments need to be fired in the kiln so your ornaments will be ready for pick up the following week. Come on out – bring a friend! Getting into the Spirit of the Season! This entry was posted on November 6, 2018, 1:20 pm and is filed under Christmas ornaments, classes, Uncategorized. You can follow any responses to this entry through RSS 2.0. You can leave a response, or trackback from your own site. Time for Fused Christmas Ornament Workshops!